File Name: Thomas S. Arashikage of Saint Louis, Missouri. Notes: St. Louis, along the Mississippi River in the east central part of the state, is the largest metro area in the state. Duke and Spearhead are also from St. Louis. Filecards from 2004 to 2005 change the middle initial to M. The 2006 filecard lists his birthplace as Fresno, CA, and the 2005/III and 2009/II filecards say he is from San Francisco. Arashikage is said to be the Japanese translation of his code name. Notes: Sunbow's Storm Shadow had no interaction with Snake Eyes, in contrast to all other media. He wore his 1984 outfit with no sleeves, and sometimes with no chest strap. His 1988 outfit appears in several commercials from that year. 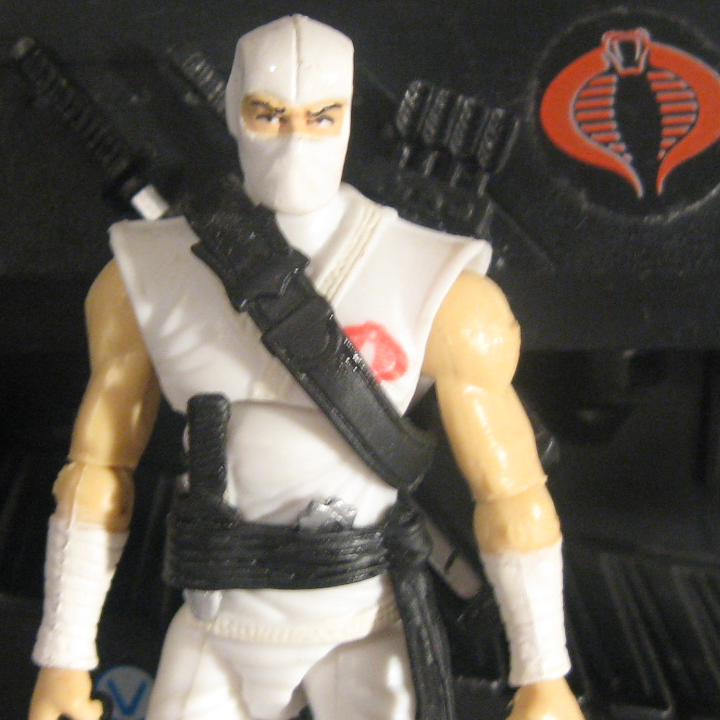 The DiC series featured his 1992 outfit and mentioned that Storm Shadow had joined Cobra to learn who had dishonored his ninja clan, and his defection to the Joe Team was taken by Cobra Commander as a personal betrayal. Spy Troops: The Movie uses a modified version of the 2002/I outfit, while his Valor vs. Venom appearance is based on the 2004/I version. Accessories: black wakizashi sword with ribbed grip (new), black katana sword with ribbed grip (new), small black nunchaku with bent chain (new), small simple black bow (new), black hinged backpack with slots for bow and swords (new). "The great Ninja assassin clans disappeared a hundred years ago. If they were wiped out, nobody took the credit for it and if they're still around - who are they working for?" Toy Notes: Featured in 1984's C.L.A.W./Sky Hawk commercial. The only figure from 1984 to be carried over to the 1986 insert catalog and 1986-style packaging. Item #6429. In pristine condition, this figure is considered a moderately high-demand item. Accessories: red sword with textured grip and slanted tip (new), black compound bow with three engraved arrows (new), black neko-te handclaw with three parallel blades, clips to arm (new), red square backpack with clips on side for sword (new). Storm Shadow served with Snake-Eyes in Southeast Asia and both of them later studied the secret arts of Ninjitsu with Storm Shadow's family, a ninja clan that could trace its history back through thirty generations of assassins. Unhinged by the murder of his uncle and mentor, he infiltrated Cobra, seeking revenge but found vengeance to be a poor substitute for life. Now, in semiretirement at a remote mountain hideaway, he occasionally takes on a special mission or two - if Snake-Eyes asks him nicely. "A ninja is a silent wraith with a razor-edged blade in one hand and a scaling-grapple in the other. Ninjas can penetrate the most sophisticated defenses and leave without a trace. They are mystic swordsmen, spies, assassins, acrobats, quick-change artists, and conjurors. Most people will tell you that ninjas don't exist. That's exactly what they want you to believe..."
Toy Notes: Item #6507. Featured in 1988's Swampmasher commercial. Accessories: white "Ninja master's sword" with angled grip and straight crossbar (new), large white "fast-grab battle double-edge sickle" (new), black figure stand (common). STORM SHADOW is a former U.S. Army LRRP, former Cobra Viper, last Grand Master of the Arashikage Ninja Clan, sword brother to the inscrutable SNAKE-EYES, and now the leader of the newly formed G.I. Joe Ninja Force. 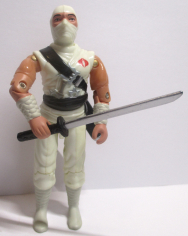 Drawing from generations of secret lore and years of practical combat experience, Storm Shadow imparts to his Ninja Force such esoteric techniques as the "Cloak of Chameleon" and "Screaming Whirlwind." When he's on patrol, Storm Shadow operates the lethal G.I. Joe Patriot. Motto: "Train hard, fight easy!" Toy Notes: With the exception of some variants, this version has tabs on his torso to keep it from pivoting, and his arms move opposite each other in a special maneuver. Item #6731. The prototype pictured in the 1992 catalog has a black sickle and lacks the white sash. Accessories: clear blue knife (93 Snake-Eyes's), clear blue sword (92 Dojo's), clear blue sword (92 Storm Shadow's), clear blue sword (93 Snake-Eyes's), clear blue nunchuks (92 Nunchuk's), two clear blue handclaws (94 Snake-Eyes's), clear blue figure stand (common). STORM SHADOW's fighting skills are known throughout the world's martial arts community, from San Francisco's Chinatown to the most remote Tiberian village. But don't expect to see him hanging around much. Now that he possesses Inviso-Power, he just might be standing next to you at this very moment - a fact that has a lot of Cobra Ninjas very, very nervous. Motto: "I can fight like a ghost with the power of a ninja!!" Toy Notes: Features a temperature-based color change from blue to white. This version has tabs on his torso to keep it from pivoting, and his arms move opposite each other in a special maneuver. Item #81142. Accessories: black short sword (84 Storm Shadow's), black long sword (84 Storm Shadow's), black nunchuks (84 Storm Shadow's), black bow (84 Storm Shadow's), black backpack (84 Storm Shadow's), black figure stand (common). He also comes from a family of ninjas, whom he rejoined after serving his time in Southeast Asia. The head of the ninja clan, the Hard Master, Storm Shadow's uncle, was destroyed. The perpetrator was believed to be Storm Shadow himself. Storm Shadow knew otherwise, and took off in pursuit of the assailants. This eventually lead [sic] him to the terrorist organization known as Cobra. Storm Shadow infiltrated the organization, serving as Cobra Commander's personal bodyguard until he could discover the truth surrounding his uncle's death. It was ultimately revealed that the assassin was Zartan, on orders from Cobra Commander, and the intended target was Snake-Eyes. Storm Shadow was ultimately denied his revenge, but also realized that his drive for revenge had nearly consumed his soul. He turned his back on the evil that had nearly claimed him. He sought out his ninja brother Snake-Eyes, and eventually joined the G.I. Joes. Toy Notes: Carded in a Toys 'R Us-exclusive Commando Team three-pack with Lady Jaye and Snake Eyes. Item #28015. Accessories: silver sword (92 T'Jbang's), silver sword (92 Nunchuk's), black figure stand (common). Storm Shadow can trace his family history through thirty generations of assassins. He can scale sheer walls with bare hands and feet, move with blinding speed, and endure unspeakable hardship and pain. Qualified Expert: Long Bow, Samurai sword, Throwing Stars, Nunchaku sticks, 8th degree black belt in five martial arts. Toy Notes: Carded in a Toys 'R Us-exclusive two-pack with Snake Eyes. Item #57728. Accessories: silver submachine gun (89 Snake Eyes's), black knife (90 Range-Viper's), two silver swords (89 Snake Eyes's), white double-scabbard backpack with red trim (02 Snake Eyes's). STORM SHADOW grew up in the Arashikage clan of ninjas and was trained in the triple disciplines of invisibility, survival, and silent assassination. 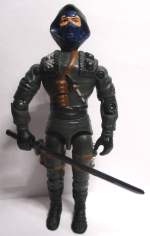 During his training, his sword-brother was SNAKE EYES, the commando and martial arts master on the G.I. JOE team. The evil COBRA organization recruited Arashikage members. This corruption split the clan in two. After a COBRA agent killed STORM SHADOW's uncle, he went undercover within COBRA to find the assassin. When the killer was revealed [to be associated with COBRA], STORM SHADOW joined the G.I. JOE Team to get revenge. But now STORM SHADOW is back with COBRA. Are all Arishikage [sic] ninjas evil? Or does COBRA COMMANDER hold some power over STORM SHADOW? Whatever the reason, his anger is clear when he meets SNAKE EYES. The battle between the ninja masters will be legendary. Toy Notes: Carded in a two-pack with Snake Eyes. Item #53112. Accessories: silver submachine gun (89 Snake Eyes's), black knife (90 Range-Viper's), two silver swords (89 Snake Eyes's), grey double-scabbard backpack with red trim (02 Snake Eyes's). Accessories: black rifle (91 Red Star's), black crossbow (02 Agent Scarlett's, with Sound Attack tab), black arrow (02 Agent Scarlett's). Toy Notes: Boxed in a B.J. 's-exclusive set with Dial-Tone, Roadblock, Snake Eyes, Wet-Suit, Fast Blast Viper, Firefly, and Undertow. Item #53227. Two-Pack Accessories: black Uzi (02 Nunchuk's, with Sound Attack tab), black knife (90 Range-Viper's), silver sword (89 Snake Eyes's), dark brown double-scabbard backpack with silver trim (02 Snake Eyes's). Gum Bitz Accessories: silver sword (89 Snake Eyes's), dark brown double-scabbard backpack with silver trim (02 Snake Eyes's). STORM SHADOW grew up in the Arashikage clan of ninjas. During his training, his sword-brother was SNAKE EYES, the commando and martial arts master on the G.I. JOE team. The evil COBRA organization recruited Arishikage [sic] members. This corruption split the clan in two. After a COBRA agent killed STORM SHADOW's uncle, he went undercover within COBRA to find the assassin. When the killer was revealed, STORM SHADOW joined the G.I. JOE team to get revenge. But now STORM SHADOW is back with COBRA. Whose side is he really on? He knows AGENT SCARLETT is trailing him, and he has escaped her traps several times. He won't let her catch him - until he wants to be caught. "A ninja moves silently and is more powerful than all your weapons combined." Toy Notes: Carded in a two-pack with Agent Scarlett. Item #53229. Reissues: Carded in February 2004 in the Gum Bitz figure single-pack assortment (Item #50402). The Gum Bitz filecard is the same except for lacking the two sentences about Scarlett. Accessories: two white gold knives (90 Range-Viper's), white gold sword (89 Snake Eyes's), white skirt with gold belt (new), black scabbard with pockets, no backpack peg (new). One of the two most dangerous men on the face of the planet, STORM SHADOW was once a master of the Arashikage ninja clan. Now, he sells his arcane skills to the evil forces of COBRA in order to pursue his twisted plan for revenge against his former sword brother SNAKE EYES. Ninjas are mystic warriors, spies, master swordsmen, acrobats, conjurors, and tricksters. They can do all sorts of amazing things - or at least seem to do them, because the ninja's prime directive is embodied in a major precept of the ancient warrior sage Sun Tsu, who said, "All warfare is based on deception." This should give COBRA pause to consider the loyalty of STORM SHADOW and ponder the question, "What does he really want?" "A sword hidden away in its scabbard does not lose its edge. The same can be said for my loyalty and honor." Toy Notes: Carded in a two-pack with Snake Eyes. Item #55466. 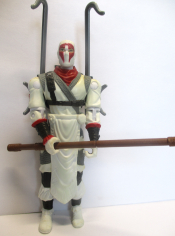 Storm Shadow's construction is altered to accommodate a spring-loaded, Action Attack ninja move. Catalog images and character art give this version blue and yellow trim instead of red and brown. Accessories: black submachine gun (89 Snake Eyes's), black sword (92 T'Jbang's), black chain whip (89 Snake Eyes's), black figure stand (common). 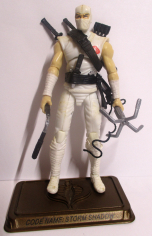 STORM SHADOW grew up in the ARASHIKAGE clan of ninjas and wears the clan's mark. During his training, his sword-brother was SNAKE EYES, the commando and martial arts master on the G.I. JOE Team. The evil COBRA organization recruited Arashikage members. This corruption split the clan in two. After his uncle was killed by a COBRA agent, STORM SHADOW went undercover within COBRA to find the assassin. When the killer was revealed, STORM SHADOW joined the G.I. JOE Team to get revenge. But now STORM SHADOW is back with COBRA. Are all Arashikage ninjas evil? Or does COBRA COMMANDER hold some special power over STORM SHADOW? Whatever the reason, his anger is clear when he meets SNAKE EYES. The battle between the ninja masters will be legendary. Toy Notes: Carded in a Toys 'R Us-exclusive set with Firefly, Cobra Nullifier, Night Creeper, Scrap Iron, and Cobra Alley Viper. Item #53913. Toy Notes: Boxed in a Kmart-exclusive set with Dusty, Snake Eyes, Iron Grenadier, a cannon variant of the Assault Quad, and two silver Air Assault gliders. 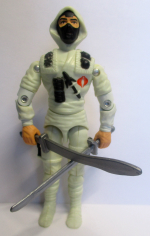 Storm Shadow was the only new figure of the set. Accessories: two silver swords with crescent-shaped knuckle guard and hooked blade (new), black two-piece bo staff (new), white skirt with black belt (04 Storm Shadow's), black square backpack with silver engraved shurikens and clips for swords and staff (new). Toy Notes: Carded in a two-pack with Kamakura. Item #55985. Accessories: silver sword (89 Snake Eyes's), black hinged chain whip (04 Snake Eyes's), black single-scabbard backpack (02 Snake Eyes's). Accessories: black sword (92 Dojo's), black crossbow (82 Scarlett's), black handclaw (88 Storm Shadow's), black backpack (91 Dusty's). Toy Notes: Carded in a Toys 'R Us-exclusive set with Black Dragon Ninja, two copies of Red Ninja Viper, and the two Vypra sisters. Item #00678. Accessories: two silver swords with brown grip (04 Storm Shadow's), brown bo staff (04 Storm Shadow's), all-white skirt (04 Storm Shadow's), black backpack with silver shurikens (04 Storm Shadow's). Toy Notes: Boxed with the playset, Ninja Battles DVD, and the figures Snake Eyes, Tiger Claw, Black Dragon Ninja, and Shadow Strike, plus an original comic. Item #56170. Accessories: two black swords (04 Storm Shadow's), black backpack with silver shurikens (04 Storm Shaodw's). Accessories: two black knives with silver blade (90 Range-Viper's), black sword with silver blade (89 Snake Eyes's), white cowl with face mask covering nose and mouth (new). STORM SHADOW was once a master of the ARASHIKAGE ninja clan. Along with his sword-brother, SNAKE EYES, he was taught the ways of the ninja by his father, HARD MASTER. STORM SHADOW could never accept that cooperation, not conquest, is often the key to victory. His desperate need to be the best in his father's eyes was a fatal flaw exploited by a COBRA ninja who infiltrated the clan. This evil ninja caused the death of HARD MASTER and had the blame fall on SNAKE EYES. This split the clan and the sword-brothers in two. Now STORM SHADOW works for COBRA in his quest to get revenge against SNAKE EYES. But is his dedication to the cause of evil the truth or a deception? Ninjas work with the art of illusion as well as the blade of the sword. What are the true motives of STORM SHADOW? "I will do what must be done to avenge the death of my father." 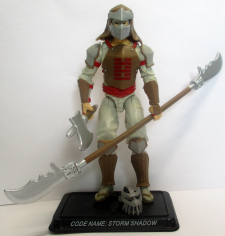 Toy Notes: Available only via the mail offer Storm Shadow Unmasked! Accessories: black sword with silver blade (02 Snake Eyes's), black single-scabbard backpack with silver trim (02 Snake Eyes's). Toy Notes: Carded in a three-pack with Snake Eyes, Red Ninja Viper, and a reprint of Marvel #21. Item #61061. Accessories: black submachine gun (92 Shockwave's), black bow (89 Gnawgahyde's), two dark grey arrows (05 Zartan's), light green vest (03 Cross Hair's), dark grey quiver (05 Zartan's). Before evil corrupted him and changed his fate forever, STORM SHADOW shared a close friendship with SGT. STALKER and SNAKE EYES, serving with them in the same military unit. Back then, he was known to everyone as "Tommy" and always carried his bow and steel-tipped arrows as well as his M16 rifle. During one long-range patrol, the three friends spotted an enemy fighter and, knowing the rest of the fighter's platoon couldn't be too far behind, they radioed for evacuation. Just as the helicopter arrived, weapons fire tore through the air, seriously wounding SNAKE EYES. Ignoring orders to leave his friend behind, STORM SHADOW ran through the crossfire to rescue him, dodging bullets with uncanny ease and saving SNAKE EYES from certain death. "I was not going to leave him behind. We would come out together, or not at all." Toy Notes: Carded in a three-pack with Lonzo Wilkinson, CLASSIFIED, and a reprint of Marvel #26. Item #13024. This comic pack is considered a high-demand item. Accessories: small black dagger with wrapped handle, silver blade, and rounded tip (new), black short sword with wrapped grip, gold guard, and silver blade engraved with Arashikage logo (new), black long sword with wrapped grip, gold guard, and silver blade engraved with Arashikage logo (new), large black bow with thin ribbed midsection (new), black quiver pack with black rope and engraved arrrows, with two scabbards for swords (new), black Joe figure stand. STORM SHADOW served with SNAKE EYES in Southeast Asia and both of them later studied the secret art of Ninjitsu with the family of STORM SHADOW, a ninja clan that could trace its history back through thirty generations of ninjas. Unhinged by the murder of his uncle and mentor, he infiltrated COBRA seeking revenge, but found vengeance to be a poor substitute for life. Now, in semi-retirement at a remote mountain hideaway, he occasionally takes on a special mission or two - if SNAKE EYES asks him nicely. "A ninja is a silent wraith with a razor-edged blade in one hand and a scaling-grapple in the other. Ninjas can penetrate the most sophisticated defense and leave without a trace. They are mystic swordsmen, spies, acrobats, quick-change artists, and conjurers. Most people will tell you that ninjas don't exist. That's exactly what the ninjas want you to believe." Battle Pack Accessories: black knife with silver blade (07 Storm Shadow's), black short sword with gold guard and silver blade (07 Storm Shadow's), black long sword with gold guard and silver blade (07 Storm Shadow's), black bow (07 Storm Shadow's), black quiver pack with engraved arrows, smooth strap instead of rope, with two scabbards for swords (new), black Cobra figure stand. Single-Pack Accessories: same as above but without the bow. "The great Ninja clans disappeared a hundred years ago. If they were wiped out, nobody took the credit for it and if they're still around - who are they working for?" Toy Notes: Boxed in a set with Cobra, Cobra Commander, Destro, Baroness, and a sound box that played a portion of the cartoon theme music. Item #26758. Re-releases: Part of December 2007's 25th Anniversary Wave 4 carded reissue assortment. Item #30442. Accessories: black knife with silver blade (07 Storm Shadow's), black short sword with red grip and silver blade (07 Storm Shadow's), black long sword with red grip and silver blade (07 Storm Shadow's), black bow (07 Storm Shadow's), black pack with red quiver and yellow arrows (07 Cobra Storm Shadow's), black Cobra figure stand. One of the two most dangerous men on the face of the planet, STORM SHADOW was once a master of the ARASHIKAGE ninja clan. Now, he sells his arcane skills to the evil forces of COBRA in order to pursue his twisted plan for revenge against his former sword brother SNAKE EYES. Ninjas are mystic warriors, spies, master swordsmen, acrobats, conjurers, and tricksters. They can do al sorts of amazing things - or at least seem to do them, because the ninja's prime directive is embodied in a major precept of the ancient warrior sage Sun Tsu, who said, "All warfare is based on deception." This should give COBRA pause to consider the loyalty of STORM SHADOW and ponder the question, "What does he really want?" Toy Notes: Boxed in a set with Cobra Trooper, Cobra Commander, Cobra Vehicle Driver, Cobra Air Trooper, and a sound box that played a portion of the animated movie's theme music. Item #26758. 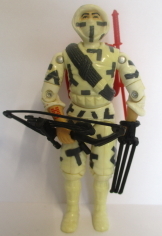 Storm Shadow's bow was packaged with the figure stands. Accessories: dark blue knife with silver blade (07 Storm Shadow's), dark blue short sword with silver blade (07 Storm Shadow's), dark blue long sword with silver blade (07 Storm Shadow's), dark blue bow (07 Storm Shadow's), dark blue quiver pack with yellow arrows (07 Cobra Storm Shadow's), black Cobra figure stand. Toy Notes: Carded in a two-pack with Snake Eyes and a reprint of Marvel #21. Item #28422. Accessories: teal knife with silver blade (07 Storm Shadow's), teal short sword with silver blade (07 Storm Shadow's), teal long sword with silver blade (07 Storm Shadow's), large blue compound bow with high-tech sight and yellow arrow (new), black pack with blue quiver and yellow arrows (07 Cobra Storm Shadow's), red cloth cloak with hood (new), black Cobra figure stand. STORM SHADOW serves COBRA COMMANDER, and bringing him a prize like the G.I. JOE team's SCARLETT will surely please the head snake. But the COBRA ninja may also have another agenda: did he choose SCARLETT because it was sure to bring his enemy, SNAKE EYES, right to him? STORM SHADOW has mastered several martial arts disciplines, making him the only one who can truly challenge the G.I. JOE team's top ninja. But it's more than just a contest to see who is the better ninja: the matching symbols on their arms reveal a hidden connection that haunts them to this day. "He may escape from me now, but one day when our swords cross, I'll make sure he doesn't walk away from that duel." Toy Notes: Carded in a two-pack with Snake Eyes and an original comic (#21b). 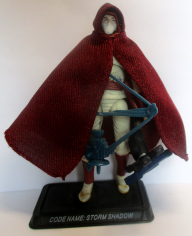 The cloak and bow design actually match Zartan's Storm Shadow disguise as seen in Marvel #45. Item #29341. Accessories: black simplified mini-Uzi with tiny trigger guard, fits into backpack (new), two black swords with gold dragon's head on ribbed grip, with silver blade (new), black neko-te handclaw with three long blades splayed outward (new), silver pair of sickles on black string, with three indents in blade (new), black vest with brown rope on sides and silver throwing stars and buckle (new), black backpack with clips on sides for swords and rope on bottom, opens to store Uzi (new), black Cobra figure stand. STORM SHADOW can trace his family history through thirty generations of ninjas. He can scale sheer walls with bare hands and feet, move with blinding speed and endure unspeakable hardship and pain. He's an eighth degree black belt in five martial arts and a qualified expert in multiple martial arts weapons including the longbow, samurai sword, throwing stars, and nuchaku sticks. His desire for revenge over the death of his uncle the Hard Master has warped his life, but it may not have completely deadened the ARASHIKAGE code of honor within him. "Revenge is a snake turning back on itself, entrapping everyone - victim and perpetrator - inside its venomous coils." Toy Notes: Carded in a two-pack with Firefly and an original comic (#4). Item #30944. Accessories: black knife with brown blade (07 Storm Shadow's), black short sword with brown blade (07 Storm Shadow's), black long sword with brown blade (07 Storm Shadow's), brown bow (07 Storm Shadow's), gold quiver pack with black chest strap and arrows (07 Cobra Storm Shadow's), black Cobra figure stand. STORM SHADOW can trace his family history through thirty generations of ninjas. He can scale sheer walls with bare hands and feet, move with blinding speed, and endure unspeakable hardship and pain. Qualified expert: Long bow; Samurai sword; Throwing stars; Nunchaku sticks; 8th degree black belt in five martial arts. As a high-ranking member of the elite and elusive Ninja-Ku clan, he is specially trained to blend with the shadows and slip past his enemies without ever being detected. 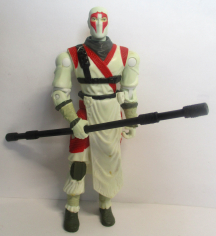 Toy Notes: An homage to Ninja-Ku, a black Storm Shadow recolor released in Argentina. Item #32494. Accessories: silver axe with brown handle (92 Dice's), brown bo staff with large silver blades on both ends (new), silver armored full-head helmet with brown neck cloth (new), silver armored face mask with grilled lower half (new), red cloth-style belt with brown interior (new), black Cobra figure stand. STORM SHADOW can trace his family history through thirty generations of ninjas. He can scale sheer walls with bare hands and feet, move with blinding speed, and endure unspeakable hardship and pain. He's an eighth degree black belt in five martial arts and is a qualified expert in the long bow, samurai sword, throwing stars, and nunchaku sticks. He's extremely arrogant about his abilities, but with good reason: he will succeed where all others have failed. An expert at sabotage, he relishes the chance to infiltrate any G.I. JOE operations base; it's a nice way to keep his skills at their sharpest...and the resulting destruction amuses him. "The G.I. JOE team can put up a good fight, but there's no way they will ever win any confrontation with me." Toy Notes: Carded in a two-pack with Tunnel Rat and an original comic (Resolute #2). Item #37447. Accessories: black knife with silver blade (07 Storm Shadow's), short sword with black grip and silver blade with red Arashikage symbol (07 Storm Shadow's), long sword with black grip and silver blade with red Arashikage symbol (07 Storm Shadow's), black nunchuks with only two links in silver chain (new), black bow (07 Storm Shadow's), black pack with grey quiver and black arrows (07 Cobra Storm Shadow's), grey four-pronged grappling hook on black string (new), black Cobra figure stand. 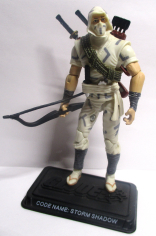 STORM SHADOW can trace his family history through thirty generations of ninjas in the legendary ARASHIKAGE clan. He can scale sheer walls with bare hands and feet, move with blinding speed, and endure unspeakable hardship and pain. An eight-degree black belt in five martial arts, he's a qualified expert in the long bow, samurai sword, throwing stars, and nunchaku sticks, as well as most conventional military weapons. His bitter rivalry with the G.I. JOE team ninja SNAKE EYES springs from a tragic incident in their shared past. The strong forces of heroism and hatred have combined within him to create one of two deadliest ninja masters in the world, and one of the COBRA legion's most powerful warriors. "One of the meanings of the word 'ninja' is said to be 'a person who conceals his presence.' You would do well to ponder that meaning and never assume you understand my true intentions." Toy Notes: Boxed with Baroness, Cobra Commander, Zartan, and Cobra Viper. Item #36448. Accessories: black knife with silver blade (07 Storm Shadow's), short sword with black grip and silver blade (07 Storm Shadow's), long sword with black grip and silver blade (07 Storm Shadow's), grey webgear with black belt and black-lined grey shoulder pads (07 Cobra Officer's), red quiver pack with black arrows (07 Cobra Storm Shadow's), black Cobra figure stand. [This set did not include filecards. The following text appears on the box back.] This ninja master works for Cobra. He is as skilled as his enemy, Snake Eyes, and looks for every chance to defeat the G.I. Joe ninja. Toy Notes: Boxed with Snake Eyes, Duke, Cobra Commander, and Greatest Battles DVD, which included Ninja Battles plus action sequences from Spy Troops: The Movie and Valor vs. Venom. Item #38905. Accessories: black knife with silver blade (07 Storm Shadow's), short sword with black grip and silver blade with red Arashikage symbol (07 Storm Shadow's), long sword with black grip and silver blade with red Arashikage symbol (07 Storm Shadow's), black nunchuks with dark silver chain (09 Storm Shadow's), black quiver pack with red Arashikage symbol (07 Cobra Storm Shadow's), light grey grappling hook on black string (09 Storm Shadow's), flat-gold Cobra figure stand.